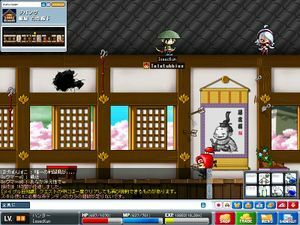 Roads: Zipangu (JapanMS, MapleSEA, GlobalMS) / Edo Village (ChinaMS, TaiwanMS). The first town you arrive at when entering Zipangu is the Mushroom Shrine, a beautiful town filled with Cherry Blossom Trees, and the backdrop of Mount Fuji. The shrine area is full of shops, selling a variety of foods with different effects. There are Takoyakis, Ramens, Octopus Balls, Dangos and many more. Mushroom Shrine is always in Springtime, so the fair climate is great for the growth of monsters, plants, and players alike. 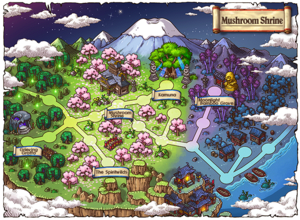 Various monsters roam the nearby countryside, from the common and weak mushroom species, to the monsters that only appear in Zipangu, like the Cloud and Night foxes, and the great for training Crows. Off the main town is an area called the Cemetery, which houses a number of undead monsters, like Ghosts and Coolie Zombies. In the last map of the Cemetery are some Bains. Nearby is a hidden street called Hall of Mushroom, where the mutated mushroom god Blue Mushmom spawns. In another map off of Mushroom Shrine, a bamboo and pine forest branches off, leading through throngs of Paper Lantern Ghosts, Water Goblins and Dreamy Ghosts, finally up to the Black Crow boss. In all versions, Mushroom Shrine is reached via Spinel the Tour Guide as part of the World Tour. In JapanMS and TaiwanMS, Zipangu can also be reached by Perry the Pelican Taxi. In JapanMS, Perry carries travelers in his mouth back and forth from Kerning City. In TaiwanMS, Perry is located in Ximending instead of Kerning City. Near the Mushroom shrine is a dark area called the Cemetery. 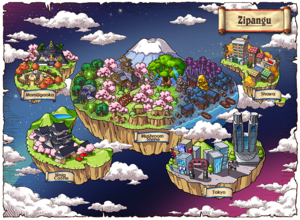 It has a bright moon shining over Mount Fuji, and as would be expected, all of the monsters here are dark or undead. Zombie Mushrooms and other undead beings walk the area, under Japanese shrines to the dead. 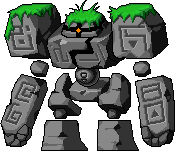 Further out, crows, which in many cultures represent the reincarnated souls of humans, fly around, and Dark Stone Golems and Big Cloud Foxes walk the earth. At the very end, a map called the WanWan Spa of Hell, where water is found, is made up exclusively of Bains (Black Snakes in JapanMS). 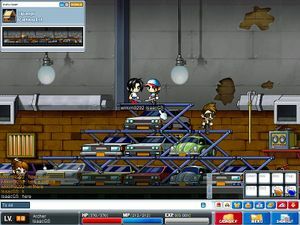 The Cemetery area is one of the few places in MapleStory that has a night sky scene, along with Korean Folk Town's Black Mountain, Formosa's Night Market and Magatia. There is also a map that leads to Momijigaoka, which is part of the Cemetery, but separate from the rest of the Cemetery maps in JapanMS. This area contains a number of monsters, including a boss. It is a foggy area with bamboo and wrecked boats in the background. Unlike the Cemetery, the moon in this map is full and overpowers the majestic image of Mount Fuji. The first map is made up of Paper Lantern Ghost, a great training spot that has, in JapanMS, become the new alternative to Zombies. The next map is made up of Three-tailed foxes, called Samiho, and Water Goblins, green kappa-like monsters. These are also a great training spot for higher levels. Beyond the Water Goblins are Dreamy Ghosts, ghostly female forms that roam on a flat and even map. At the far end is a giant golden Buddha statue, under which the Black Crow boss spawns. It is a powerful and annoying boss, often leading to the death of unsuspecting people training here. 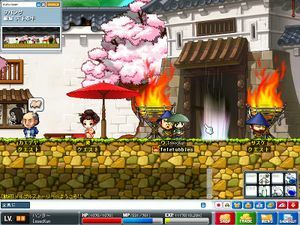 This area is commonly called Himes by Maplers. 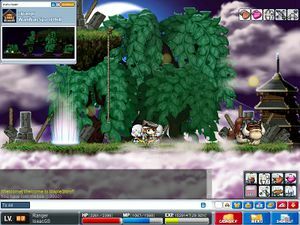 In MSEA, the ghostly female ghost is called Mong. Cassandra (right area of the map). Gachapon (right area of the map). Spinel (far left side of the map). 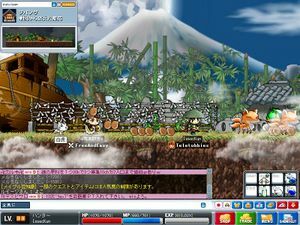 Zipangu: Mushroom Shrine Not available in GMS. Roads: Zipangu (JapanMS, MapleSEA, GlobalMS, EuropeMS, BrazilMS) / Showa Village (ChinaMS, TaiwanMS). When most people think of Zipangu, they are usually remembering parts of Showa. After walking to the right of Mushroom Shrine, the maps begin to change into a street or alleyway. The enemies look like players, and roam the streets wielding guns, swords, baseball bats and bricks. In one of these streets, the Male Boss of the Yakuza, the Japanese gangster group that operates like the Mafia, spawns. These Yakuza members and random bosses pose a hazard to lower level players venturing to Showa. Once in Showa's Main town, there is a sauna, with secret maps filled with monsters. There's a number of quests and even a Free Market Entrance. The NPC shopkeepers here sell different items that act like return scrolls, instantly taking you back to areas of Zipangu. Also, there are hair and skin salons, and NPCs selling rare Gachapon only items for very high prices, some of the only items from an NPC for over 1 million mesos. Transports you between Showa Town and Near the Hideout maps. Transports you between Armory and The Nightmarish Last Days maps. Inside Showa, an NPC will lead you to the Showa Hideout, where large numbers of the human monsters appear. These are far stronger than the members roaming outdoors. The maps range from Parking Lots to Break Rooms. 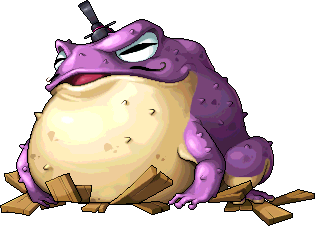 Towards the end, a Female Boss, commonly called Anego, is found, and beyond her is the room where both Bodyguards and the Grandpa Boss are found, the most difficult single form boss in the game. 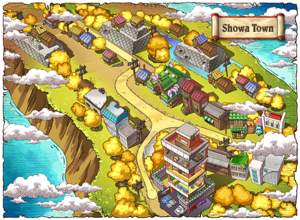 Showa Hideout is currently not available in ChinaMS. 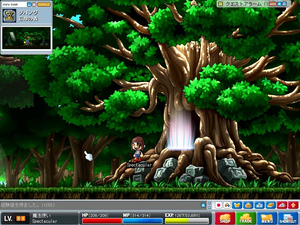 This a relatively small forest area located between Mushroom Shrine and Outside Ninja Castle. It is accessible by entering a huge red gate portal located near the Mushroom Shrine Gachapon. This place has no monsters but it serves as a pit stop before accessing Neo Tokyo by talking to the NPC Asia who is located in a map accessible by entering a massive tree. 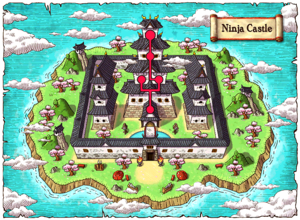 Ninja Castle can be accessed from Kamuna via the Warp Crystal (JapanMS, TaiwanMS, MapleSEA, EMS), or from Mushroom Shrine via the Feudal Lord's litter (GlobalMS). 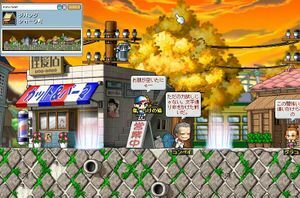 There are NPCs who give quests and sell the same items that are available in Showa Town. There is another map before entrance into the castle where a number of NPCs are also gathered, though unlike a traditional town map there are also monsters here. Ninja Castle is one of the strongest areas in Zipangu. On the outside of the castle there are many lower level minions. 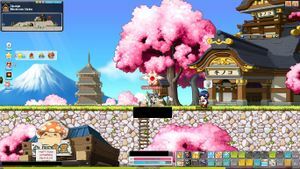 Once the player enters the castle, the monsters instantly become stronger, and by the time a player reaches the center, the monsters reach level 100 plus. The maps are difficult to navigate, as there are no blue portals to signify doorways, and there are trap doors that can send a player backwards all over the place. Subi throwing stars and arrows can be seen sticking out of the walls,and even walked on. At the heart is the 2nd highest level boss in the game, the Feudal Lord. Roads: Zipangu (JapanMS, MapleSEA, GlobalMS,) / Edo Village (TaiwanMS). This page has been accessed 254,869 times.